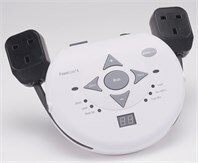 The PowerLink® 4 control unit allows switch users to control up to two electrical appliances with single switches. Six unique modes of control allow you to define exactly how, and for how long, appliances will be turned on. 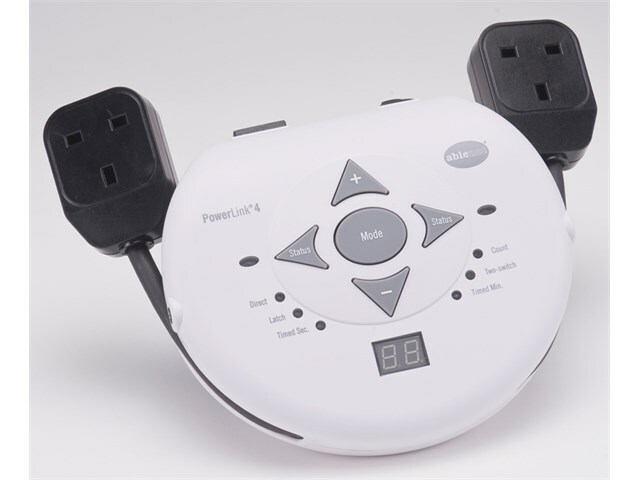 PowerLink can be used with any of our wired switches. It can also be paired directly with AbleNet’s Big and Jelly Beamer wireless transmitters. Easy set up with built-in display and a simple new design. Powerful access with six modes of control. Accurate programming and data collection like never before. Flexible outlets allow custom positioning of up to two appliances, activating independently. Linkable™ wireless technology for use with multiple Big or Jelly Beamer switches. Count: Behaves like direct, but shows the number of activations. Two switch: Behaves like direct, both switches must be activated. Timed Seconds: Runs appliance from 1 to 99 seconds. Timed Minutes: Runs appliance from 1 to 99 minutes.